Art of Football encapsulates moments of inspiration, emotion and and energy into pieces of Art. These pieces are the basis for designs of T-Shirts, Canvas prints, Sweatshirts and more. The business is doing well, and The Sporting Blog stumbled across it whilst messing around on Instagram. We reached out to Marketing Director Luke Cuthbert, and fired a few questions his way. Oh, and this isn't a promoted post, we aren't getting anything out of it we just like the business. The Sporting Blog : What was the inspiration behind the business and when did you get started? Luke Cuthbert : The business started almost 4 years ago. It was the Aguero moment which was the inspiration. Jumping out of the chair and yelling euphorically when that goal went in just highlighted how football grabs us all - we are not even City fans. Gabe is our artist and he worked out some new designs and how we could get them printed on to tees and we went from there. TSB : Can you explain the process that goes into designing a piece? LC : Generally we are looking for those exciting moments, the last minute goal to win the Cup, Play-offs, avoid relegation etc. 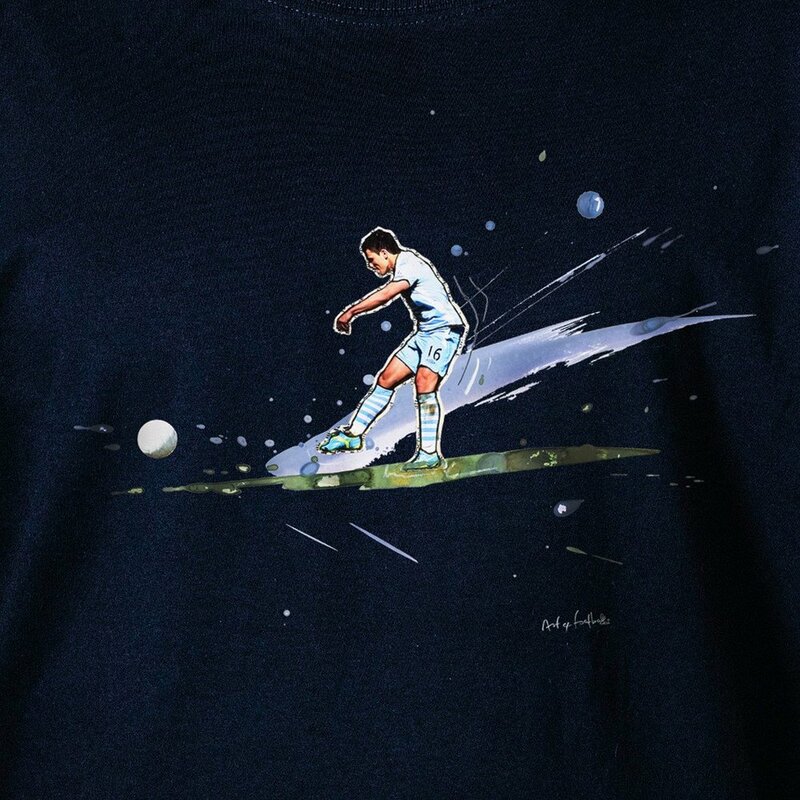 But as we have gone on, Gabe has developed different styles to celebrate outstanding players or classic moments that mean something to all football fans -the Bobby Moore tackle, the Cruyff Turn and so on. So it always starts with a moment or a player and he builds from there. Hopefully the finished product conveys some of that excitement, movement and skill. TSB : Who was or is your target audience? LC : Our target audience is all football fans both young and old. Obviously a lot of our stuff is club based and so it helps to relive the moment whether you were there at the game or watching on TV. So a lot of the time we are aiming at people who were actually there when the moment happened. TSB : Without giving away too many trade secrets what team or nation is the most popular with your customers? LC : Our England stuff has done well despite the lack of success by the team. But the response from the Welsh fans, ever since their team's success in the Euros, has been amazing. They love the Robson-Kanu goal. For individual players, the Invincibles design with Henry and Bergkamp and the Cantona design are both very popular. The best moment for us has been Bobby Zamora scoring the last minute winner in the play-off final to get QPR into the Premier League. TSB: What has been the biggest challenge from a business point of view? LC : There have been lots of challenges along the way from deciding to invest in our own expensive printing equipment to making sure we have the right quality of t-shirt. When we started the business Gabe was still at school and Luke was at University. We were in Nottingham and our printers were in Cheshire and it was hard to keep control at very busy times. Then we decided to print for ourselves and this meant finding suitable premises and taking on an employee. We haven't looked back since then. TSB : What are the plans for the future? LC : We want to continue expanding the number of clubs we cover - eventually we would like to have designs for every club in the Football Leagues as well as a number of foreign clubs. We get requests from all over the UK and from abroad as well. We also have plans to widen the range of products we do. 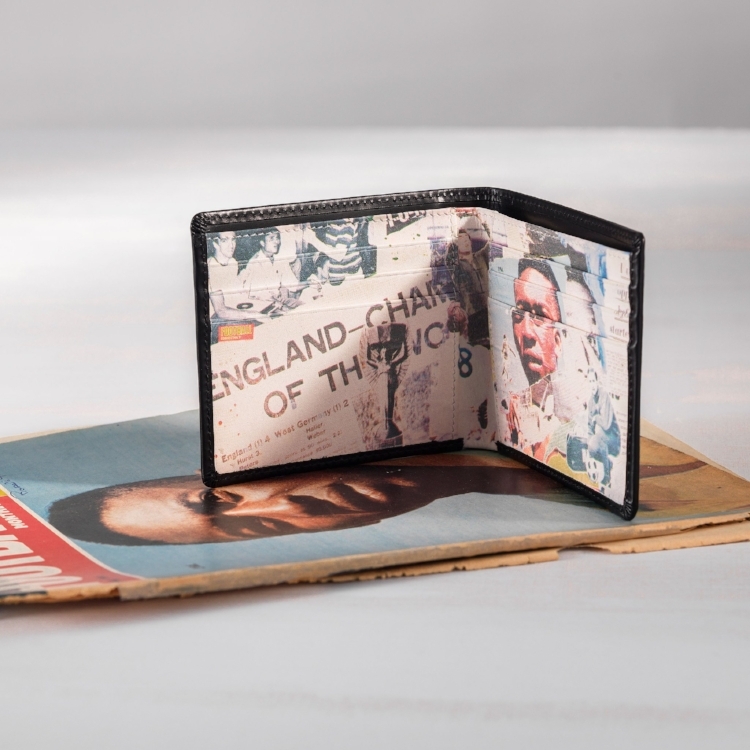 So we recently launched a limited edition Italian calf leather wallet that celebrated football in the 60's and we are working on a small range of exclusive socks based on some classic kit designs. LC : Ronaldo - Messi is the more naturally talented but I admire Ronaldos determination and work ethic.